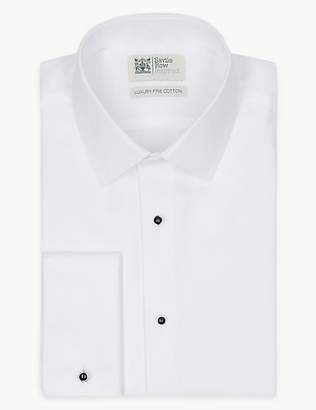 Inspired by the fine tailoring of London's renowned Saville Row, this men's pure cotton shirt will introduce a touch of sophistication to any look. Tailored for a stylish slim fit, our men's shirt is shaped from luxury fine cotton and features a subtle textured pattern for an extra hint of interest. Perfect for teaming with your favourite suit, this timeless wardrobe staple will be sure to impress.